The Bowie softball team tried to beat Holliday at home Friday night. 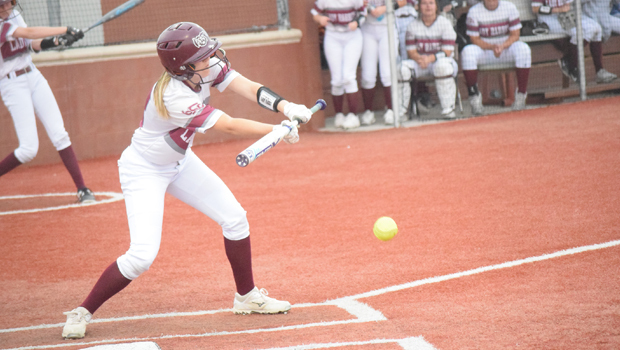 The Lady Rabbits came up short late as the Lady Eagles scored six of their runs in the fifth and sixth inning to win 8-3. Early in the game it was back and forth. Holliday batted first and took the early lead. The leadoff batter was hit by a pitch. Four batters later with two outs, a single drove in the runner to give the Lady Eagles a 1-0 lead. Bowie answered in the same inning. Gracie Bentley hit a double to right field with one out. Two batters later there were two outs and Bentley had advanced to third base on a wild pitch. Alexa Holzer hit a ground ball to the third basemen, committed an error that allowed her to reach first base and Bentley to reach home, tying the score 1-1. A leadoff walk was left stranded at first as Lady Rabbit pitcher Alexa Holzer retired the next three batters in order. On offense Hannah Love hit a two out single up the middle, but that was all as the game advanced to the third inning. The Lady Eagles were able to break the tie. A single and back-to-back walks loaded the bases with one out. After the second out, an error at third base allowed one run to score. Holliday led 2-1 before Holzer forced a pop out to the short stop for the third out. Again Bowie’s offense responded. A fielding error allowed Bentley to get on second base with one out. Carrington Davis followed with a single that put runners at the corners. Pinch runner Maril Gatewood stole second before Holzer grounded out to the shortstop for the second out. It was enough to drive in Bentley and move Gatewood to third. Jasmine Jones gave Bowie the lead as she put the ball in play and an error at second base allowed Gatewood to score. The Lady Rabbits led 3-2 after three innings. In the fourth inning both teams had their leadoff batters get on base. A fielding error on a bunt allowed the Lady Eagles to get a base runner. Despite reaching third thanks to a sacrifice bunt and a ground out, that is where the runner stayed as Holzer forced another ground out to first base for the third out. Leadoff for the Lady Rabbits Addie Farris hit a double to right field. Following a strike out and a ground out, Farris was at third base ready to score on a base hit when the next batter struck out to end the fourth inning. Holliday was able to retake the lead. With two outs and two runners on base, back-to-back singles scored two runs to give the Lady Eagles a 4-3 win. Besides a drawn walk with one out from Bowie’s Davis, the Lady Rabbits could not respond as the game moved to the sixth inning. Things kind of went off the rails for Bowie. Three hit batters, a fielding error in the outfield and a base hit doubled Holliday’s score to 8-3. Besides a single from Farris, the Lady Rabbits struck out three times as the game moved to the seventh inning. Bowie was able to keep the Lady Eagles at bay despite a walk, an error and a base hit. Chelsey Ketchum got on base by being hit with a pitch with one out. Unfortunately it was followed by a strike out and a ground out to end the game. Holliday won 8-3.